A federal judge has denied the Standing Rock Sioux tribe’s request for a temporary injunction to halt the construction of the Dakota Access pipeline. The Obama administration later issued a statement halting construction on the pipeline. The judge said the Army Corp of Engineers “has likely complied with the NHPA (National Historic Preservation Act) and that the Tribe has not shown it will suffer injury that would be prevented by any injunction." Judge Boasberg ordered the parties to appear for a status conference on September 16, according to the Associated Press. Just moments after the ruling, the Justice Department issued a statement halting construction on the pipeline on "land bordering or under Lake Oahe." Solidarity protests have popped up in New York City and Chicago. “When this pipe goes under the water, it’s going to threaten our people’s water source,” the culture editor for Indian Country Today, Simon Moya-Smith, told RT from a protest in New York. He accused President Barack Obama of ignoring the issues his Native American reservation is facing. “We have treaties with the US government that they continually break. Their assault is on us, not on them,” Moya-Smith said. In its lawsuit filed in August, the tribe had challenged the Army Corps of Engineers' decision to grant permits at more than 200 water crossings for Dallas-based Energy Transfer Partners' $3.8 billion pipeline. They argued the projected violated several federal laws, including the National Historic Preservation Act, and will harm water supplies. The tribe also says ancient sacred sites have been disturbed. The ruling said that "this Court does not lightly countenance any depredation of lands that hold significance to the Standing Rock Sioux" and that, given the federal government's history with the tribe, "the Court scrutinizes the permitting process here with particular care. Having done so, the Court must nonetheless conclude that the Tribe has not demonstrated that an injunction is warranted here." A lawyer for the tribe says the ruling will be appealed. 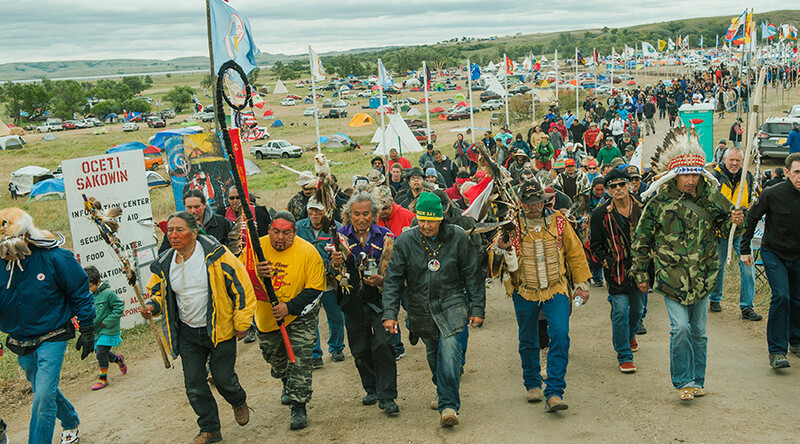 LaDonna Brave Bull Allard, who also has been a part of the protests which began in April near the North Dakota reservation, told AP that the tribe will "continue to stand" and "look for legal resources," as well as continue to protest peacefully. The tribe had achieved a temporary stop work order on Tuesday ahead of Friday’s ruling after arguing that sacred sites in North Dakota had been bulldozed at the weekend. The desecration came a day after the tribe had identified the sacred sites in court papers as part of their lawsuit against the Army Court of Engineers. The 1,172-mile pipeline project when completed would travels across four states is expected to carry nearly half-million barrels of crude oil daily from the Bakken oil fields in North Dakota. The pipeline would travel through North and South Dakota, under the Missouri River, through Iowa to an existing pipeline in Illinois. The tribe claims the Army Corps of Engineers fast-tracked approval for the pipeline without properly consulting them. Energy Transfers Partners said they planned to have the pipeline completed this year. In court papers, they argued stopping the project would cost it $1.4 billion the first year, mostly due to lost revenue in hauling crude. "Investor appetite for the project could shift and financing may no longer be available," the company said, according to AP. "Construction of the entire project would cease and the project itself would be jeopardized."